How can I add employees and customers to join my Academy? In schooX there are two ways to add users to your Corporate Academy. You can either add them manually one by one, or add several at a time by uploading a spreadsheet containing all the necessary information. 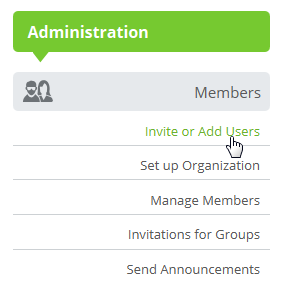 In your Administration tab, click Members, then Invite or Add Users. Click "Add Row" to create a new record and start to fill in the user's fields. Email is optional (but, as you'll see later, highly recommended), and the password for each individual is automatically generated. Then assign them to the appropriate above units, units, jobs, and academy permissions. If an individual is associated with more than one of these, you’ll need to copy their row, and adjust the information as needed. To copy a row, check the box next to it, and click Copy Row. When add into Schoox, the rows will then be merged into one.You can delete rows the same way – check the box next to the desired row, and click Delete Row. If you need to start over, I can click Clear All, and all the work you’ve done up to that point will be erased. Schoox will automatically warn you of any errors by turning a row red, and displaying an error code in the error column. Hovering over the error code will reveal what it means. More information on the specific error codes can be found in the How To guide and under the section Error Messages of this page. When finished, click Add Users to bring them into your academy. 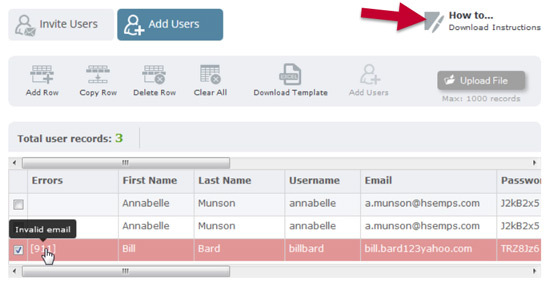 Click "Download Template" to download the sample spreadsheet. You can use this as a template to fill in user's data. Input all users' info into the file. Please Note: each row corresponds to a user record. After finishing, save the file to your computer. Click "Upload File" and select the file you have just saved. Click "Open" to start the uploading process. When this file is loaded, your employees' data will be populated on the page. Correct any errors you might get and add or delete rows if necessary. Schoox will automatically warn you of any errors by turning a row red, and displaying an error code in the error column. Hovering over the error code will reveal what it means. More information on the specific error codes can be found in the How To guide. Individuals added will automatically receive an email from Schoox with their password. If the user you're trying to add exists with a different name, a warning message is generated indicating that the new name will be discarded. If a password already exists, the corresponding field will be marked as "Already Set" which means you can’t change it. Feel free to contact support@schoox.com, for anything you might need on this process.